Sales Order Processing and Invoicing modules are both installed. They do not share information. Transactions should be entered in one module only. When using eConnect with your .NET application, you might want to use tracing to monitor the execution of your application. The classes in the Microsoft.Dynamics.GP.eConnect namespace support .NET tracing. This one is normally pretty easy to fix, you just... get the debits and credits to equal. But I ran into it today with an Integration Manager integration using eConnect and Analytical Accounting and the fix was not so intuitive. This article details a complete, running code example for the eConnect IVInventoryTransactionType. This code, and all our other eConnect examples, is on the eConnect menu. This code example is a complete running code example for the IVInventoryTransactionType eConnect integration. All the rest of our code examples can be found on the eConnect menu. This article shows how to save document attachments from a Sales Document to a temp file. Just a sample of some of my code, I am not a trained programmer but this works. This is a particularly nice piece of user-submitted code that shows not only how to achieve a goal, but how to use the 'tables' in VS Tools. Great read! The caller was not authenticated by the service. The request for security token could not be satisfied because authentication failed. This article shows how to connect to Web Services for Dynamics GP and pass credentials. The example uses .NET code. This is a complete code example for the POPReceivingsType schema, showing how to receive lotted items. Error message when you try to export a package file: "One or more components cannot be exported because they belong to a VBA project that is locked"
Website takes invoices from GP web services, allows the user to make a payment and then transmit the payment information for that invoice back to GP. I'm getting validation errors trying to do this. A validation exception has occurred. - If AllocateLotBehavior equals 0 the taSopLotAuto node should not be called. - A validation error has occurred. Quizás quisiste decir: en GP10 Necesito una tabla que me relacione los cheques pagados a proveedores con la orden de compra mediante la cual se gestionó la compra. Ayuda a mejorar el Traductor de Google. GP 10.0, I need SQL tables linking me checks paid to suppliers with the purchase order by which the purchase was handled. Our system is currently configured to pull the A/P offset accounts based on the vendor type. Is it possible to establish offsets based on the GL expense code? Is there a screen or table where the output options can be set for the reports created by the PA Reconcile Utility? I'm trying to close years of open projects, and while it's only a time-wasting nuisance, it would be nice to be able to set these ahead of time. To clarify a bit more, I want all of the results to always print to the screen. Econnect outgoing - The queue does not exist or you do not have sufficient permissions to perform the operation. Using econnect out of the box. Requester set up and transactions available in SQL "eConnect_Out". But they do not make it to the outgoing queue. The queue does not exist or you do not have sufficient permissions to perform the operation. System.Messaging.MessageQueueException: The queue does not exist or you do not have sufficient permissions to perform the operation. installing eConnect 10 Sql objects only - HOW? Hi - is it possible to install eConnect 10 to a GP 10 environment? We only want the SQL objects and nothing else. We tried to move them from one DB to another but the procs are encrypted. Any ideas? I I am trying to receive a PO line with a lot and its giving the subject error. Any help would be appreciated, as far as I can see the qty numbers are the same. A bit of an update on this, this is currently failing on previously tested receipt lines and lots that had been created. I have been trying to find the property to use when naming a ship to address for a customer when using the dynamics GP web service to export my customers to GP from the application I am working on. I have had nothing but trouble finding answers for any kind of c# coding to GP web service type dev. Here is a picture of the field I am trying to fill in. 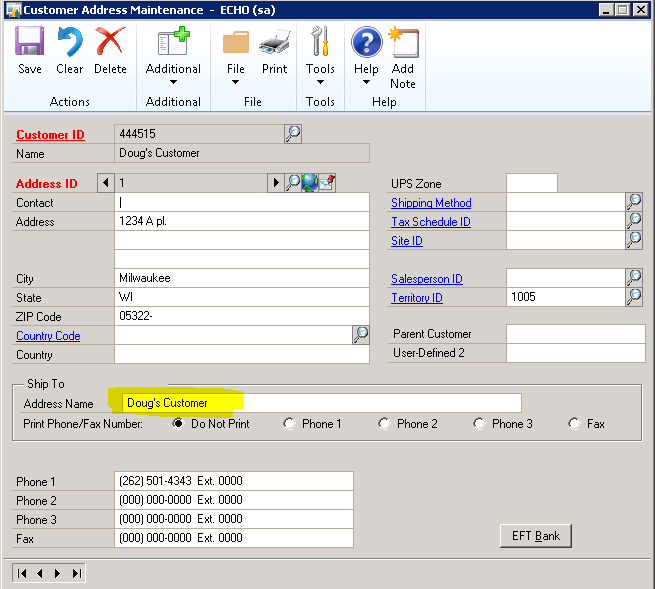 The highlighted box is the one I cannot get to display correctly, it looks like it is just filling in the customer name. But I need it to display the name of the ship to address for this customer. Can anyone help me out here with a property name I can use to fill in this field? When our comments are being passed into GP using web services for a sales invoice all of the line breaks/returns are either being removed or not recognized.. Does anyone have some info on what line break character GP will recognize, so that the formatting of the comments being passed in will be retained?